Thing’s are really heating up at the Casa Loma this week. 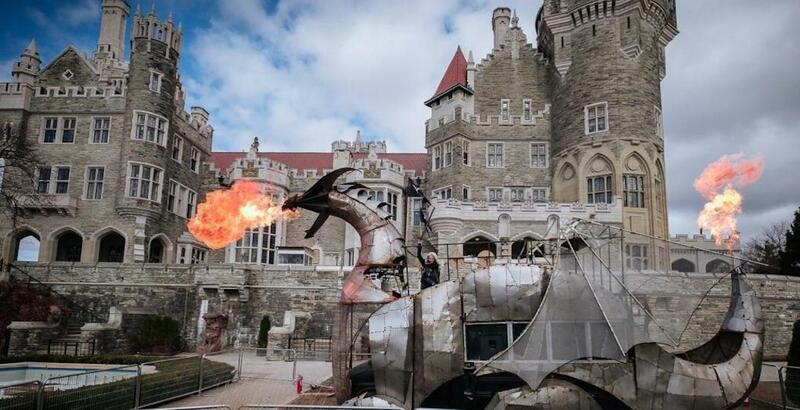 This March Break, Toronto’s Casa Loma has been transformed into a fairy-tale castle from the era of dragons and adventure, as part of the Imagine Dragons programming. Complete with theatrical and interactive live shows, knight school, and a stable filled with Medieval stallions, the castle promises to transport visitors back in time to a bygone era. But if that’s not enough to spark your interest, visitors can also check out Heavy Meta, a 30 ft. long, 19 ft. tall metal, fire breathing dragon. While you can’t get up close to the dragon, visitors can view the dragon from the terrace. But don’t worry, it’s so powerful you can still feel the heat from the fire. If you can’t make it to the Casa Loma during March Break, here are some photos and videos to show you what you’re missing. But trust us, they don’t do this dragon justice. Full scheduling can be found here.